Recoleta: Pacheco de Melo St. bet. Callao Ave. & Ayacucho St. This beautiful 2 bedroom apartment of 110 sq. mt. (1184 sq. 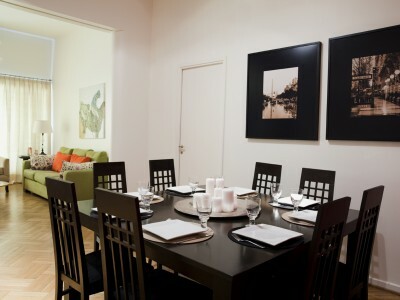 ft.) is ideally located in fancy Recoleta neighborhood. It’s near to the best shopping spots, restaurants, and cafes in Buenos Aires. Location is perfect due to the proximity to Santa Fe Avenue, the largest open air commercial center of the city, with easy access to public transportation. Bright and delightfully apartment located on the 1st floor at the rear of the building. Hardwood floors extend throughout the entire apartment, illuminated by cozy balcony. 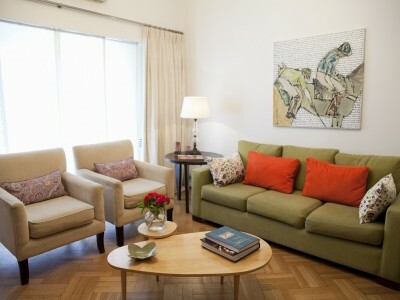 The living room features a beautiful comfy sofa with coffee table and chairs, adjoining the dining room with a dining table for up to eight people. From the living room, guests will find two bedrooms. 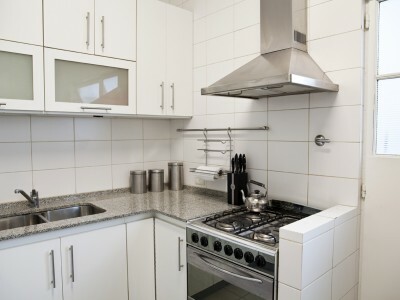 The kitchen features a cooking space and washer. 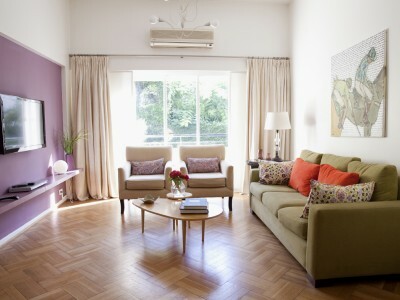 -LIVING-ROOM WITH DINING AREA: nicely decorated room with a LCD TV, sofa, coffeetable, armchairs, and reading lamp. Dining table with eight chairs. Air-conditioning. Phone. Internet Wi-Fi. DVD player. Wooden floors. Access to the balcony. 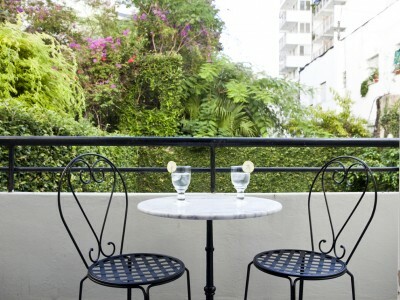 -BALCONY: cozy balcony with delightful green view. There is a table w/ 2 chairs. -MAIN BEDROOM: spacious room with a luxurious King-size bed. Large closets. Bed-side cabinets and lamps. Air-conditioning. Wooden floors. Lot of light with nice view. 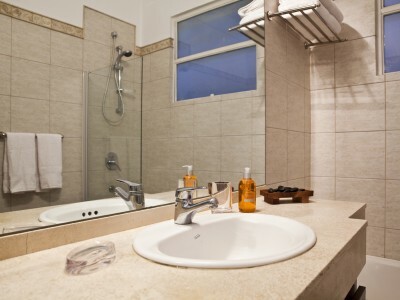 -BATHROOM: Complete bathtub with shower. Hair dryer. -SECOND BEDROOM: very nicely decorated with two twin beds. Closets. Wooden floors. Writing desk with one chair. 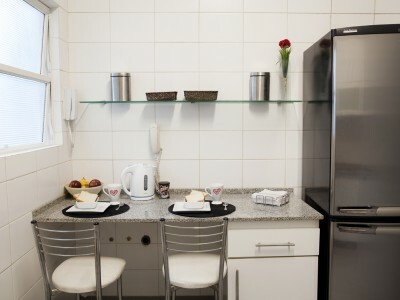 -KITCHEN: completely equipped with fridge with freezer, oven, microwave, electric toaster, blender. Complete tableware. Washing machine. These rates are final in USD; they include: building expenses,cable TV, electricity, water, gas, Wi-Fi internet access, cleaning service once a week and taxes. Please note: Rates from December 20th to January 5th are higher for this apartment.